My name is Cherry Collins and I have been fortunate to study Tai Chi one of the most skilful and respected Chen style Tai Chi Masters in the UK, master Wang, Hai Jun. I have also undergone two periods of full time training at the Traditional Chinese Martial Arts School, Shandong province in 2009 and again in 2011 when I also spent some time living on Wudang mountain studying Taoist Wudang Tai Chi. I am taking a further period of study in China in 2012, bringing my total time spent studying tai chi in china to about 15 months, 8 hours a day. I have a Level 3 Instructor's qualification in Tai Chi and Qigong awarded by the UK Chen Style Tai Chi Centre and a 3rd Duan Wei, awarded by the Chinese Wushu Association. I am also a member of the Tai Chi Union of Great Britain and hold full public liability insurance for my classes. Friendly Class, lots of demonstrations and explanations given, lots of time to practice. Lovely location overlooking the canal with car parking right beside the venue. 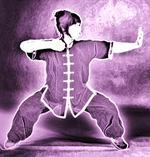 Come and see how Tai Chi & Qigong can improve your health & outlook. No joining fees or subscriptions. Pay weekly only when you attend. Friendly classes - beginners welcome. No subscriptions - just come on the night & pay as you go. Ages All - 18 to 80! Friendly classes, new members welcome at any time. No need to join or sign up - just come along and try it! The Chen Double Fan Form that we teach comprises 22 movements. The class begins with some simple tai chi stepping and silk reeling exercises which will teach your body how to move in the 'Tai Chi' way. Next we look at how to hold and open/ close the fans in both hands. After this we move onto opening and closing the fans in various positions. Once we have got the hang of these techniques we add some footwork to develop full-body and mind coordination. The 22 movements of the form are taught in the remainder of the class at a rate of about 3-4 per week. Each week we recap and then build upon what we have learnt so far. We should cover all 22 movements over 8 classes but students always find something new when they have revisited the fan form again, such is the depth and scope of Tai Chi. The dexterity developed by opening and closing the fans throughout the form increases digital joint mobility and strengthens the muscles and tendons of the hand, wrist and arm, helping such conditions as Tendonitis and Repetitive Strain Injury. It also tones up the arms - say goodbye to those Bingo Wings, whilst learning an elegant, ancient art. Fan manipulation encourages development of the non-dominant hand (the left hand in right handed people, and vice versa) and gives your brain a 'neurobic' workout by making it concentrate on something new. While your brain is adjusting to performing these new tasks, under-used neuro-pathways and connections are activated. This stimulates the growth of new brain cells and brain connections. I lived at this martial arts school for nearly 6 months in 2009 and 3 months in 2011, studying martial arts 5 days a week, 8 hours a day, and would thoroughly recommend the experience to anyone wanting a change from the Western way of life :) Good for the body, mind and soul! I gained my 3rd Duan Wei grade after 2 years of studying Chen Tai Chi in the UK and China with top Chen Masters in both countries. Pay weekly, only when you come. No contracts, No upfront payments, no hidden extras, just good authentic Tai Chi!